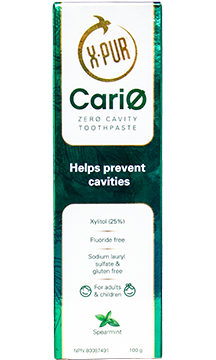 X-PUR CariØ, with its scientifically proven 25% xylitol formulation, works during the colonization and adhesion of the caries process to reduce the cariogenic bacteria load. For many years, studies have shown that the tooth decay causing bacteria are not able to metabolize xylitol, which results in an absence of lactic acid and polysaccharide production. This is why X-PUR CariØ is effective to prevent the caries process, reduce non-cavitated and cavitated lesions and remineralize. 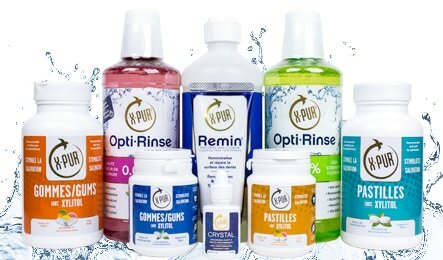 Water, hydrated silica, sorbitol, cellulose gum, sodium lauroylsarcosinate, spearmint flavor, sodium benzoate, calcium glycerophosphate, saccharin, limonene. 1. Brush with a small quantity of toothpaste. Expectorate. 2. For optimal results, do not eat, drink or rinse for 30 minutes. Dr. Jacques Véronneau, D.M.D., M.Sc., Ph.D. Since 1952, fluoride is the most widely used therapeutic agent in toothpaste. For adults and children highly infected by cariogenic bacteria (100,000 Streptococcus mutans / mL of saliva), which represents approximately 66 % of your patients*, fluoride toothpaste will remineralize, but might not offer optimal removal of cariogenic bacteria. This is why, more than 12 years ago, Dr. Jacques Véronneau, clinician, researcher and one of the only cariologists in Canada, began his journey to identify a therapeutic agent able to reduce the cariogenic bacteria load. He then began many studies, the most important being with 99 Kosovar children, to confirm the efficacy of a 25% xylitol toothpaste (therapeutic concentration) against cariogenic bacteria. The results were really conclusive and this is why we are now launching the 1st Canadian 25% xylitol toothpaste with a scientifically proven formulation to reduce bacteria load! Below are the results of Dr. Véronneau’s studies. 1. Jacques E. Veronneau, DMD, PhD1, Blerta Laiti-Xhemaji, PhD(c)2, Adim Begzati, DMD, MSc2. 1McGill University, Canada; 2Prishtina University, Kosovo. RCT TESTING THE EFFICACY OF NATURAL TOOTHPASTE ON THE CONTROL OF CARIOUS PROCESS: A NEW ERA OF THERAPEUTIC EFFICACY IN PRIMARY PREVENTION. 2. Ioana Chi, MSc(c)2, Jacques E. Veronneau, DMD, PhD1, Mindra Badea, DMD, MSc2. 1McGill University, Canada; 2Cluj University, Romania. 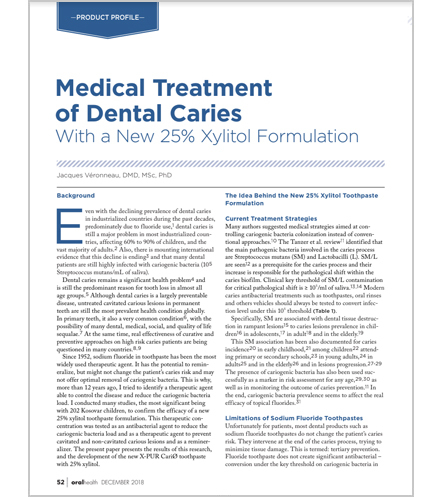 THE MINIMAL AND SUSTAINABLE TIMEFRAME FOR AN ANTIBACTERIAL EFFECTS OF XYLITOL 25 % TOOTHPASTE: OBSERVATIONAL DESIGN DOCUMENTING. 3. Blerta Laiti-Xhemaji, PhD(c)2, Jacques E. Veronneau, DMD, PhD1, Adim Begzati, DMD, MSc2. 1McGill University, Canada; 2Prishtina University, Kosovo. TOBSERVATIONAL DESIGNS TESTING THE ANTIBACTERIAL EFFECTS OF NATURAL TOOTHPASTE ON CARIOGENIC BACTERIA.